2018.05.21 Registration page has been updated. 2018.05.18 Program page has been updated. 2018.05.14 Access page has been updated. 2018.01.31 Abstract Submission was closed. Thank you very much for Submitting. 2018.01.24 Deadline for Abstract Submission has been extended. 2017.12.06 Call for Abstracts submission page has been open. 2017.09.05 10th JOSKAS Website has opened. 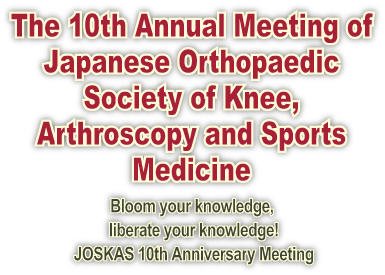 Copyright © The 10th Annual Meeting of Japanese Orthopaedic Society of Knee,Arthroscopy and Sports Medicine. All Rights Reserved.